After a day of careful eating, I have eaten a very light dinner. I ate a cup of homemade chicken soup for breakfast. For lunch, I ate two ounces of grilled chicken and a honey crisp apple. For dinner, I ate a grilled artichoke. Period! I considered eating more, but quite frankly, I couldn't figure out what else to eat. We went to Stanley's for dinner. It was very difficult for me to understand what was gluten free. I guess I have more reading to do. However, I knew that the time it would take for me to eat an entire artichoke, would equal the time it would take Tony to eat a salad and an entree. So...that is all that I ordered. And I feel satisfied. Day 2 of the Virgin diet is over. If I lost a pound for every dollar I've spent trying to lose weight, I'd be on the Dr. Phil show looking anorexic. Today I bought another book. "The Virgin Diet" by nutritionist, JJ Virgin. She claims that most people with an obesity problem suffer from food intolerance. It is similar to a food allergy, but not as severe. You slowly suffer from the ill effects of certain foods without really noticing. She advises giving up 7 of the highly intolerant foods for 21 days, and see if you notice a difference. If you do have an intolerance, you will not only feel much better, but lose weight as well. You are probably wondering which 7 foods are the culprits. Here is the list: soy, sugar, (including artificial sweeteners), eggs, corn, dairy, peanuts, and gluten. I can pretty easily give up most things on this list. The hardest item to avoid is gluten. It is hidden in so many things, and it is not actually listed on the ingredient labels. I know not to eat breads unless it is labeled gluten free. But gluten hides in so many products - even ketchup and white pepper! We'll see if I can manage this one. As far as today goes, I have succeeded. I made a chicken soup for lunch, and salad with grilled chicken for dinner. It was a bit boring, but I finished day 1. The new behavior introduced on Day 3 of the Beck Diet says you must eat sitting down. That is an easy one for me. I am a diner not a grazer. Tonight I didn't have to worry about anyone but myself. I was home alone and could make anything I wanted for dinner. I was looking forward to dinner because I really hadn't eaten much today. I ate a cup of shrimp soup for breakfast, shrimp soup for lunch, and grapes as a snack. I was definitely hungry for dinner, but I didn't want to go to too much trouble since it wasn't really necessary. I looked in the freezer and decided to defrost a hamburger patty. I added a few vegetables to eat with it and I was finished. It's amazing how easy cooking can be when you only have yourself to please. As I said earlier, I am still following "The Beck Solution" program. I need to pick two diets. I am picking up a new book tomorrow that I think I will use as my primary diet. It is called "The Virgin Diet". (Virgin is the author's last name.) I watched her on an infomercial recently and she requires only 3 weeks to see results. That sounds doable. My back up plan will be plain old calorie counting. There are so many apps for the Iphone to track calories, that I think it will be a reasonable back-up plan. I made a big tray of roasted mini peppers from Costco tonight with the intention of adding them to my salad. I also made a big pot of Mrs. Renfro chicken for the rest of the family. Anne invited a friend to join us and by the time we sat at the table, I lost my resolve to diet and just ate a chicken burrito too. I went to bed and read Day 2 of "The Beck Diet Solution". Day 2 says I need to pick 2 diets. I need one to start with and a back up plan if that one doesn't work. More on this tomorrow. Finely dice vegetables and seafood. (I omitted the crab) Add juice. You can add hot sauce if you wish, which I did. I also added a little bit of salsa. It was surprisingly filling. I had a couple of cups for dinner and I was very content. There is enough to keep in the refrigerator for a quick snack tomorrow. Only there is one problem. After I ate the soup and wrote this post, I read the ingredient list on the Clamato. Besides a lot of words that I can't pronounce, high fructose corn syrup was listed as the third ingredient. I should have just finished off the cheesecake. No seriously, it was still only 60 calories per cup. Next time I will use tomato juice and add a little clam juice to it. I did something today that I really don't recommend, but I enjoyed it nonetheless. I was very frugal with my caloric intake all day, and for dinner I splurged on homemade Caesar salad. I even included freshly made garlic croutons. Do I feel like I was cheating? Not at all. It may not have been the healthiest choice I could have made, but it was actually pretty low in calories. I didn't have anything else with it, and lettuce takes a while to chew so I didn't feel deprived eating only salad. All of the "kids" are home for the weekend. Most of the leftovers are gone. Everyone is running in different directions. I'm tired of going to the grocery store. We are all pretty much doing our own thing. Rather than focusing on food, Tony and I decided to go to the movies. We went to see "The Life of Pi". Wow! What a beautiful movie. We are still on holiday mode, so although I'm not being terribly strict with my diet, I am also not overindulging. 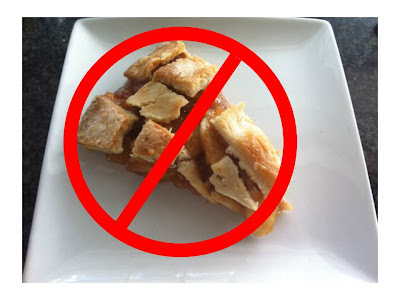 I chose to watch Pi, not eat pie! I ate a deservedly unexciting meal tonight. Like I said earlier; since I overindulged yesterday, I decided to make up for it tonight with a very low calorie meal. I kept to my plan and ate left over turkey and vegetables. I came very close to eating my homemade cheesecake but I stopped myself. Today I was proud of Patti's extremely barren plate. I’ve been grateful for a lot of things lately, but I have to be honest. Today I am just thankful that this holiday is over! How crazy is it for a person who is trying to lose weight, celebrate a holiday that is centered on food? I remember back to my old weight watcher days. The leader would give helpful hints that would lead up to Thanksgiving. “Just remember to concentrate on the love of family and friends, and not think so much about the food.” Or, “Load up on a lot of raw vegetables and then just eat the white meat of the turkey.” Right! Just pass on the cheese platter or the fresh homemade Italian bread that Uncle Chris brought? We’ve been preparing food since Monday night. Was I really supposed to eat celery and be content to watch my size 0 sister in law eat Brie? The food seemed exceptionally good this year. (Have I been depriving myself too much lately?) I followed a recipe for brining and roasting a turkey. The instructions were so explicit, it was hard to err. We ended up with a turkey that had dark crispy skin with moist delicious meat. It produced perfect gravy with flavors of sage, thyme and rosemary. I wasn’t about to pass on the opportunity to put it on everything, especially the mashed potatoes! So, I ate yesterday. I ate with abandon! I am not going to bemoan a day of eating when I have really been so good. Today is a new day. I have plenty of leftovers for the family. I also have plenty of raw vegetables left over. Tonight I will eat raw vegetables and the white meat from the turkey. And I will concentrate on the love of my family. Happy Thanksgiving to all of my readers! I am so grateful that I always have something to eat on Patti's Plate. There are many in this world that are not as fortunate. Have a great day. And as a really good friend of mine told me, "Remember to set the scale back 10 pounds tonight!" Tomorrow may be Thanksgiving, but as far as I am concerned , I could never be more grateful than I am tonight. Sometimes I'm not very imaginative. I hate trying to think of different meals to make for dinner. It is especially hard when the fridge is still empty. I did go to the grocery on Monday, but only to pick up a few essentials for Thanksgiving. (i.e., the turkey for brining; more on that later) When I came home tonight, I was still in a quandary as to what to cook. Since I enjoyed my arugula salad so much the other night, I just copied it more or less. - a lot less. When Thanksgiving is over, I will try to get more creative in my cooking. For the record, I want to let it be known that I actually exaggerated a little bit last night. It felt like I was totally out of control and eating everything in sight. This morning I was able to rethink everything that I ate yesterday, and came to the conclusion that I was actually pretty good. First of all, let me just put this out there. I went to dinner with Mom again. My mother has always been the type of person who is a lot of fun, but who really takes her food and dining seriously. I obviously do too, but unlike me, my mother has always found fault in her restaurant experiences. Some of her favorite sayings are "I like my hot things hot!" "I work like a man, I should eat like a man." "Your serving is a) bigger, b) rarer, c) juicier, d) hotter, etc. etc. than mine." You get the picture? For starters, she was convinced that her Chivas Regal that we ordered her last night was definitely NOT Chivas. Also, as luck would have it, her glass was dirty. Once, we exchanged the drink that the waiter witnessed being poured out of the Chivas bottle, she was left with a glass with "mainly ice" and two small pieces of a lemon twist. She was quite surprised that they would be so "economical" with their lemons. My husband offered to get her a lemon wedge, but by the time the waiter came to the table, the drink was gone "it was all ice" and she decided to have a glass of Chardonnay. She went with the recommendation of the waiter, even though she had "never heard of that wine before." So, now that the mood of the table has been presented, let's get to Patti's Plate. I actually refused the delicious hot bread that they normally serve, and ordered a steak and arugula salad with a reduced vinaigrette sauce. It was actually so good that I felt like I was overindulging, but in retrospect I was not. We also had an order of sweet potato fries that I should have passed on but I didn't. Another indulgence was my Beefeater gin martini. But, heck. I've always worked like a man. Why shouldn't I drink like one? I need to learn to control my emotional eating in time for the holiday season. The index card didn't work tonight. I almost ate it too. Tonight I had the pleasure of taking my Mother out for dinner. We went first to an art show and then tried to figure out what restaurant to go to for dinner. I did not want to spend another Saturday night eating Mexican food. We tried to find something different. We searched from downtown Los Angeles to the San Fernando valley. There were four people in the car, each with their own suggestions. Driving in rainy traffic discussing our options, the ride seemed to take much longer than it should have. We finally settled upon the old Pinot Bistro restaurant which is now an English Pub called the Kings Head. None of us had been there before so we gave it a try. It was warm and relaxing, quiet with white tablecloths. It was a very nice atmosphere even though Mom pointed out that the English are not really "known" for their food. The menu was quite extensive with items like fish and chips, steaks, burgers, salads, and curries. Thank goodness the restaurant was kind enough to substitute the peas that they normally serve with the pepper steak with onion rings for my mother. I gazed at the long menu, and fought the temptation to ease my nerves by ordering something warm and comforting. I took out my index card and read my reasons for wanting to be thin. I then ordered a green salad with strips of chicken. Mom's probably right. The English don't cook that well. Day 1 requires recognizing and writing down the reasons that I want to lose weight. I am supposed to keep an index card with those reasons with me at all times. I am to read it often enough so that I eventually learn to conquer any sabotaging thoughts that I may encounter. OK. I can do that. Tonight I really had to fight my demons. 2) Both Tony and I worked today. 3) The refrigerator is relatively bare. 4) Tony does not need to diet and he is perfectly happy being married to an overweight woman. I quickly retrieve my Advantage Response Card. I read it. I read it again. I go to the freezer and I find one lonely package of frozen raviolis. Hmmmm. This may work. I show Tony and he actually gets excited. I will eat my chicken breast leftovers again. (No one else really liked them anyway, that's why there is still some left.) We will stay home this Friday night and make the best of it. The good news is that I have made it through my first day of the Beck diet. And, we were able to find an adequate dinner to stay home and enjoy a Friday night. And....Tony was even able to share "The Merry Widow" opera with me in his music room. And....I actually enjoyed it. I definitely need help in dealing with temptations like I experienced last night. I have been skimming through a diet book recently , and I think it is time for me to take the book and it's advice a bit more seriously. It is a cognitive therapy approach to weight loss. It is a "how to" guide to stay on a diet; it is not the diet itself. The name of the book is " The Diet Solution", by Judith S. Beck, Ph.D. There are some things that she requires of the reader, that I'm uncomfortable doing. However, she is the expert, and I'm still the fat person. So I guess it's time to defer to her expertise. It is a 6 week plan again and there are daily assignments. Here I go again. By the way, I ate the chicken dinner last night and it was quite good. Today is my creative cooking day. I have a package of boneless, skinless, chicken breasts in the refrigerator awaiting a new identity. I've been reading online, perusing my cookbooks, and hoping for inspiration. Wouldn't you know it, when I was just about to lose hope, cousin Costa called from Charleston. When he is not lecturing me on my politics, he is telling me about the delicious food he has just made. I knew he would be the perfect person to ask for help. Although maybe his recipes are not always low calorie, he does normally cook with whole fresh foods and everything he has ever made us has been delicious. He gave me the idea to stuff chicken breasts with bacon and cheese and fry them in butter until they are golden brown. Well, I obviously had to tweak the recipe a bit to remove a few calories. I improvised on his recipe, left out the cheese and added dates and capers. Then, I did a light egg wash and rolled them in walnuts. I will be baking them, not frying. Time will tell how they turn out. I'm going to add a salad, spinach and sweet potato. Finally, something different on Patti's plate. Update: Ernie called and said he was picking up Barone's pizza. Tony suggested we eat the chicken roll tomorrow. The temptation was too great. I caved. Today, the really nice lady who I work for saved me. I went to work this morning unprepared for a proper lunch. I had eaten a high fiber cereal for breakfast, with blueberries. That usually keeps me full enough so that I don't think about food while I work. I also bring a sliced apple to snack on and I usually don't think about eating until I get home. I stayed a little later than normal, and I did get hungry. My boss is always offering me food and I always decline. Today she tempted me with a hard boiled egg. She said, "you should always keep hard boiled eggs in the refrigerator for a quick healthy snack." She is so right. By the time I got home I was hungry again and tired too. Tony came home a few minutes after me and he was also exhausted. Neither one of us wanted to think about cooking dinner. Today was not the right day to think of something new and creative to cook. We took a nice walk up to our neighborhood restaurant, The Valley Inn, and I had a "kitchen sink chopped salad" with vinegarette on the side. There wasn't a lot of protein in it, but it certainly did the trick. Tomorrow I have the day off of work, so hopefully I will get my act together! It's sort of hard to keep this blog new and interesting. It's obviously just as hard to keep my diet new and interesting. I need to find a way to jazz things up a bit. When I was a Nutritarian, I was on an actual plan, and it was pretty easy. I think I have given myself too much freedom. I need to find a new plan to share. I should be showing you a picture of some great low calorie dish that is worthy of Patti's plate. But, I will be honest with you. Most nights are really difficult to keep low calorie and exciting. Take tonight for instance. My husband worked most of the day from home, and then we went to an afternoon movie. When we got out, we tried to decide what to eat for dinner. We had leftovers from the last few days, so I knew we had food to eat. He had the fattening spaghetti, and I made another boring salad with the same old chicken I had a few days ago. I was too lazy to add colorful vegetables to my salad, so my green salad and the green chili chicken look the same. I need inspiration. Today, my daughter texted me when I was on my way to church and informed me that tonight we are having family dinner at 6pm at our house. Family dinners are what we used to do for years every single night. Even when the kids were involved in sports, plays and orchestra recitals, we almost always managed to sit down together in the dining room and have a lively dinner. That all came to a pretty abrupt end when Anne left for college. Sure we would still have family dinner now and then, but the boys were often busy and slowly it became just my husband and I eating dinner in front of the TV. Recently, we somehow have managed to have a full house again. Family dinner is still pretty much a thing of the past or resurrected on a holiday or special occasion celebration. I miss it, and to be honest I think our family misses it too whether or not they realize it. So this afternoon, when deciding what to make for dinner, I settled upon a family favorite, "spaghetti in a pot". It is definitely not diet friendly, but it is a traditional comfort food that I know everyone likes. I'm making a choice again. It's only one meal and I will continue my diet tomorrow. To be honest, I am going to add a salad and I may just have a small enough portion of spaghetti that I will be fine anyhow. The important thing to me is I will have my family around me, eating a meal that I have lovingly prepared. I just miss Ted. I did not have one chip tonight! That is really pretty big for me. I copied everything that my sister ordered. I had one glass of red wine instead of my usual double margarita. We had a white meat only chicken tostado with boiled beans and no tortilla. (Shouldn't that just be called a salad?) Honestly, it wasn't really that hard to eat this way tonight. I am not sure if it was because I promised myself before I went that I was going to be good, or if having someone else at the table eating the same way made me feel less alone. Whatever the reason, it worked! If I ate with her very often I think this blog would be out of business pretty darn soon! There are so many types of food to choose from when I go out to eat. I could easily go out for pizza, tacos, enchiladas, spaghetti, or even just a plain old hamburger and French fries. I tell you this to try and get you on my side before I tell you what I ate. I know I am not going to wake up any thinner than I did today. But.......there is a slight chance I won't wake up any heavier either. I've had a pretty good day. I had high fiber cereal, blueberries, and non fat milk for breakfast; a honey crisp apple for lunch; and a cup of homemade chicken soup as a snack when I got home from work. For dinner, I went to a restaurant that had a roasted chicken Friday night special on their menu. I ate a chicken breast, green beans and baked potato for dinner. Should I tell you what I didn't eat? No, I didn't have wine with dinner. I did not have sour cream with my baked potato. And, I definitely did not have dessert! Not at the restaurant, and not when I got home where I still have left over Halloween candy. Do I deserve to wake up thinner? I think so. Will I be satisfied if I wake up the same weight? Yup. It was a nice night and I didn't have to cook. I know I often talk about my crock pot, but I guess I just can't say enough about it. Today I was craving a steak. Since beginning my Nutritarian diet a couple of months ago, I have had red meat only once. I actually was going to post about it a couple of weeks ago, but I got distracted. Anyhow, I went to the store today to buy a steak for dinner tonight and I just could not get myself to buy it. The price was almost $20.00 a pound! Granted, I was shopping at Gelson's but even Costco is $12.99/lb. and you have to buy almost $60.00 worth! So, I came home with a package of chicken breasts. ....again. Just how many ways can you make chicken? One of my all time favorites is chicken breast fillets in the slow cooker. I rinse them and put them in the pot on low. A couple of hours later I add Mrs. Renfros green chili sauce. The ingredients are all natural, (no preservatives) and there are only 5 calories per tablespoon. The chicken falls apart, and most of my family make tacos out of it. I took out a few pieces, added a half of a sweet potato and an arugala salad. Delicious! I bought 2 Pasilla peppers at Gelson's the last time that I shopped. For those of you who don't know what they are, let me describe them. They are large, dark green, shiny peppers with a mildly hot taste. I have had them at Mexican restaurants stuffed with cheese and melted to a gooey goodness that is delightful. I'm sure that was my attraction when I purchased them at the grocery store. I looked at them and imagined them stuffed with cheese and I bagged them before I could even think. Tonight, before they went bad, I decided to cook them. I broiled them in the oven until they turned black and placed them in a paper bag to steam. Then, I easily peeled the charred skin away and diced the softened flesh. I added it to my vegetable chicken soup and it gave it a spicy flavor that added another dimension to my low calorie dinner. The best thing about watching my weight, is the satisfaction I get from cooking more creatively. I love Election Day! In an election year, I try to watch all of the debates and I try to read as much as I can about all of the propositions. Unfortunately, I have grown more and more cynical the older I get, but I still try to be optimistic about the future of our country. Back to Patti's plate.......I usually order pizza. The second I get home on election night, I turn the TV on and I watch the results all night long. Someone orders pizza delivery, and I mindlessly eat, usually caring more about if I get a corner piece than who actually wins. (That's a little exaggeration; but you are correct, Vanessa, not much.) Anyhow, tonight was different. I started a new tradition. I defrosted White Roughy fish fillets from Trader Joe's and decorated them with blueberries and red peppers. I added a green salad and though I could definitely eat more, I am happy with the portion that I received. Hmmmmm. I wonder if that is what our entire country is thinking right now. As I was taking a picture of my dinner tonight, I came to the conslusion that I may be getting a little boring with my "good" dinners. 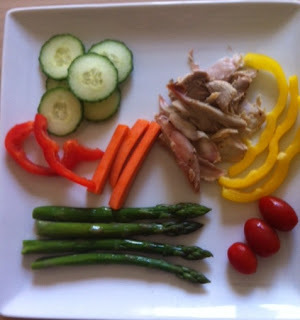 I scrolled through my blog a bit and I concluded that if I wasn't cheating, the food didn't look very exciting. The salads look monotonously similar. So this blog is helping me in more ways than just serving as a food journal and making me accountable. It also is helping me see that I need to get more creative in my cooking to keep me interested in healthy eating for the long run. I don't know what I'll be eating tomorrow, but I know I need a change. When trying to lose weight, there are so many variables that enter into the equation. 1) Which diet is best? 2) Will you have the help of family and friends? 3) Will you be able to eat like this forever? 4) Will you be able to combat emotional eating? These are just a few thoughts that come to mind. I think one of the biggest hurdles to overcome, is learning to tune out those people who may unknowingly sabotage your effort. These are the well meaning people who tell you the "right" way to lose weight. Let's face it. All overweight people know how to lose weight. We've lost hundreds of pounds before. The problem is that we always gain back more than we lose. The vicious cycle never seems to end. However, for some people it finally does. Eventually, for those who are lucky enough, they finally figure it out. And the light bulb moment usually comes on through no help of anybody else. It is their own personal realization. It won't happen if you give up. It only happens if you keep trying. So often the "fat mind" is stubborn. It hates to be told what to do. When a skinny ___________(insert spouse, parent, relative, friend, co-worker, stranger) tells a fat person what to eat and how to eat, the fat person often does just the opposite. They are already out of control with their eating, so instinctively they try to muster a little control by not listening to the other person. It's counterproductive but understandable. I can think of plenty of times that I have acted in that way. I know for sure that my Dad did. Anyhow, I think I have possibly gotten to the point that I will continue losing weight. I don't intend to be perfect every single day. I will try to recognize which days I need to really watch it and which days I can take a break. I need to learn the best way to do it for me. It may mean being selfish or acting like a hermit now and then, but I need to remember that self preservation and care is ultimately a gift that we give to those who really love us. There are some restaurants that are just easier to totally avoid rather than try and abstain from eating my favorite foods. 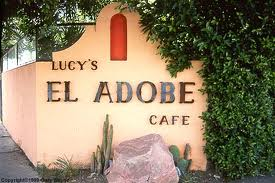 Lucy's El Adobe Cafe is one of those restaurants. I have probably been going there for almost 50 years. It's my home away from home. I ate my first BBQ taco dinner there when I was about 9 years old and I have wanted to order it every single time I have gone back since. When my husband suggested that we take my mother there on Saturday night, I knew I would be in trouble. However, just because I have a weight problem, doesn't mean I should punish Tony for my lack of willpower. I agreed to go. I tried to make some changes from my usual El Adobe experience. I didn't order the freshly made delicious guacamole. But, I did eat the hot, crunchy tortilla chips. I couldn't pass up the incomparable quesadilla with mild peppers especially when my husband added jalapeños to it. Normally I would order the taco dinner, but I ordered a boiled bean tostado with a fresh (not fried) corn tortilla on the bottom. Who was I kidding? I just ate a bowl of chips! Add the special Santiago margarita and my diet was totally gone. Now, maybe I would have had more willpower if I was going there more often. But, I haven't been there in over 3 months, and it was Saturday night, and well.....oh well. Today's entry could either be really long or really short. I am going to opt for the short version. My husband and I took my Mom to dinner last night. Thank you, Lynn. Patti's plate has never looked so good! Today, Patti's plate had the most delicious breakfast on it. Two perfectly poached eggs were laying on top of a bed of endives. Again, credit goes to my random new friend, Laura, who labeled me anemic a couple of days ago. She said I should be eating eggs at least twice a week. She also told me to make sure that I eat the entire egg, not just the whites. (Something about bringing "new life" into my body) Hey, it works for me. They are much tastier with the yolk. The other bit of advice that she gave to me, is to make sure that I eat them with greens and not toast. She said it is never a good idea to mix protein and starchy carbohydrates at the same time. She was thin and had a European accent so I tend to believe her. Yesterday, a random woman looked at me and asked me why I was so anemic. No, I wasn't dressed up as a ghost. She questioned what I normally eat and I told her. She then lectured me about the merits of eggs and animal protein. She wrote down the name of a vitamin supplement and told me to immediately go out and buy it. A couple of blocks later, I found myself in front of a vitamin store. I went in and had a long discussion with the owner. He told me that there has never been a famous athlete who was a vegetarian. (I don't know if that is true, but he did have an autographed photograph wall of body builders in his store - even Arnold!) He didn't carry the supplement I was looking for, so I ventured on to Capital drugs. (A homeopathic drug store) I bought the bottle of liquid vitamins. I'll let you know if I notice a difference. Also, for the first time in over 6 weeks I will be eating eggs for breakfast this morning.